Whenever one is trying to change an old habit or learn a new one, there’s a lot of practicing involved. I’m trying to hold up and not give in to chronic loneliness, with not so good results. Hormones aren’t helping these days, which adds a new obstacle to work through. Actually, there are quite a few obstacles to work through. The shortening day length certainly affects my mood. I want to sleep more, or just lounge in bed more. I feel little motivation to go out and do anything, and I want to eat more junk. I need to get to the gym more often; the endorphins are supposed to help one feel better, right? At least I’m remembering to take my vitamins and weekly shot. When I start forgetting them I get much worse. I realized today that it was around this time last year my marriage really ended. I went to see the lawyer during the first week of November, but we had finished our final talks about a week before then. So, I have a grim anniversary of sorts to celebrate here. Whippee. Misty was visiting me this weekend so I had close companionship for much of it. We went to a couple live performances, ate good food, and hung out. She had to leave midday on Sunday and I went off to a graduation party for my new roommate. The rest of the afternoon and evening was just a painful mess, though. I sat and drank tea, watched terrible TV, and found myself scanning CraigsList and eventually Match.com. Once I got in bed I called my sister for some comfort. I cried. I tried to sleep but I couldn’t, so I got up and took a klonopin. And I finally drifted off somwhere around midnight I think. This weekend I had a conversation with Misty about pharmaceuticals and how I try to avoid taking them as much as possible. I fought hard not to take an SSRI during the divorce process because I hate how they affect me. I’ve taken 2 different SSRIs for various reasons: Paxil for panic disorder, and Lexapro for depression. Neither has been kind to my body. So is it any wonder that I declined an SSRI over and over again while going through the divorce? Having just started to recover my normal weight after getting my thyroid condition treated, I couldn’t stand the thought of derailing those efforts with a stupid pill. And while I certainly wasn’t getting any action from my soon-to-be-ex-husband or anyone else, solitary pleasures were one of the few enjoyable things I had going on at the time. I wasn’t a total stoic, though, and I gladly took some klonopin. Klonopin and I are old pals. It got me through the immediate affects of the panic disorder many years ago, and it proved to be effective in helping me with the divorce anxiety, too. Klonopin lubricated the days and nights for me, and helped them slip by with less stress. It’s non-habit forming so the doctor gave me quite a bit, and I still have a huge bottle left. It’s been several months since I took a klonopin, so it felt OK to do so last night. It certainly did help still my mind and roll back some of the restlessness I feel when contemplating my empty days and empty nights. But I still can’t take it regularly. Even at a very small dosage, it makes me more slow, dopey, and sleepy. I’d much rather find another solution to my bouts of blues and anxiety, which is why I want to get into meditation. Who would have thought that sitting in silence and not thinking would be so hard? First, there’s the trick of finding the right place and position. With the dogs and the roommates around, I think the only quiet place where I won’t be disturbed by creaking floorboards or whining animals is the basement. So I’ll fix myself up a little nest there and set a timer for 5 minutes to start. If I can sit for just 5 minutes, I think that would be a great accomplishment. I’ll work my way up from there. And, as I searched around the Internet last week I found a meditation center here in Chicago that has open house every Sunday morning. If I can squeeze it in next Sunday I’ll give it a try. Until then, I’ll rely on my old stand-bys: good friends on my call list, and a little “big pharma” as a last resort. My support network is a bit diminished right now. Adrienne left for Iona last night and won’t be back for 2 1/2 weeks. Eek! She needs this break, though, and Iona for her is like Big Sur or northern New Mexico is for me: the place you go when you want to lift your heart. The lucky among us have found such places and get the chance to visit them often enough. I’ve had to do that more than a few times over the past several days, but I’m doing OK. I still feel lonely quite a bit, but I think that’s normal. Yesterday I did some searching online and found a meditation center here in Chicago that I think I may visit. They have open meditation sessions on Sunday mornings, so I’m thinking of working that into my schedule one weekend. Not this weekend, though. This weekend I’m all set to have a rollicking good time with Misty. She’s in transit now from Indiana and we’re meeting up in the Loop to kick off a girls weekend. I scored some cheap tickets to the Goodman Theatre’s Animal Crackers for tonight so we’ll grab a quick bite, enjoy this highly acclaimed show, and then head back to the house. We may hit a haunted house tomorrow night; we’re being sort of flexible with our plans, so we’ll see. Next weekend is Halloween and I’ve been invited to a party at my sister’s house, but I think I’m going to a Meet Up function with the usual ladies (Rachael, Jamie, Chris, etc.) instead. Then it’s November. Wow, the seasons are disappearing rapidly, aren’t they? I’d love to take another short trip before Christmas, but I’m not sure if it’s possible or where would be good to go. I have some park hopper passes for Disney World in Orlando, but that’s not the kind of trip I’d like to do on my own. There were no cool trips this weekend, just lots of stuff getting done. Saturday was mainly about food prep, as Rachael came over and we cooked up two huge pots of applesauce. Instead of canning it, we decided to just bag it up and freeze it in carefully measured amounts. In total, we made 37 cups of applesauce, plus a smidge more that was sent home with another friend, Chris, who stopped by just as the sauce was being finished. She helped bag it up so she scored some to take home. We made plain and simple applesauce: no sweetening, and no spices or other seasoning. We figured that this way it was like a blank canvas that could be dressed up as needed. We left the peels on as it cooked, and it gave the sauce a different flavor than last year’s batch. Not one that I liked very much when tasted warm, but Rachael and Chris said that the taste was changing slightly as the sauce cooled. We’ll see; frankly I wanted the sauce mainly for baking, as it can be used to make cakes and other baked goods that are moist with less fat. While the applesauce was cooking, we filled up the dehydrator with slices of eating apples and Asian pears. Last year we learned that when dehydrated, Asian pears are like wafers of sugar: crunchy and super sweet. I’m not a big fan of Asian pears anyway, and definitely not dehydrated into sugar wafers; Rachael loves them, though, so we made sure that several trays were done. All of this was accomplished by 1 PM, at which point Rachael left with her bags of sauce and Chris stayed on to wind some yarn. She kindly dropped me on Sheridan Road to make some purchases on her way to another appointment. I was back home again by 4 PM, and took a bit of rest before heading back out to get groceries. Everything went so smoothly and with such little strain that I was surprised to be bone tired by 9 PM. I struggled to stay awake through the evening news and the beginnings of SNL, then gave up and went to bed. Today I finally got my act together and went to the gym. I really worked myself hard with 40 minutes on the elliptical and another 25 minutes of ab work. After I got home and devoured an early lunch, I rested for an hour and then went out to tackle the yard and the chicken coop. There are still a couple plants in the ground, but most of the garden clean up is complete. And I gave the chicken coop and run area a good cleaning and tidying. Once back inside I vacuumed the house, cleaned the bathroom, and finally showered. Then I put my feet up and read for an hour before returning to the kitchen to cook up a big pot of vegetable soup and a pan of cornbread. Sound exhausting? I think it shouldn’t be, but I find myself once again ready to slip into bed and go right to sleep. Friday night and Saturday night I must have gotten at least 8 if not 9 hours of sleep, but it doesn’t seem enough. It gets dark so quickly these days and I think it is affecting my energy level. It’s also very likely that I have a case of the blues, too. Last night I really didn’t want to be alone and the thought of sitting at home by myself left me feeling down. It’s not as if I couldn’t have visited or gone to a movie with a friend, it’s just that I wanted someone to be there with me at home. Last weekend I wasn’t alone, but this weekend I was and I really felt the difference. I keep experiencing mostly good things with this roommate arrangement, and I’m grateful for that. I hope it keeps up and the blue funk rolls away. I was in 5 different states this weekend. Impressive, eh? On Friday I started out in my home state of Illinois, then flew east to visit a friend. I arrived at Reagan National Airport in Virginia, then hopped the Metro and ended up in Maryland. That’s 3 states visited in a matter of 3 hours, and I also traveled through the District of Columbia, too. 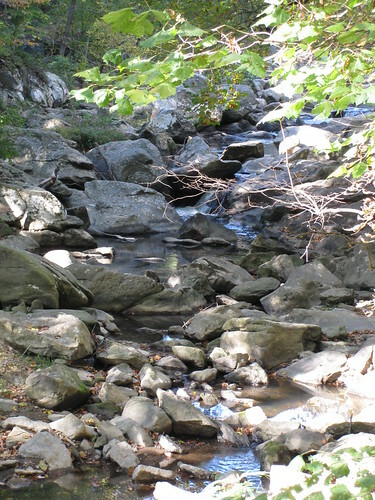 Most of our time was spent in Maryland, though, where we enjoyed a hike on Sunday morning along one of the creek ravines (was it Rock Creek? 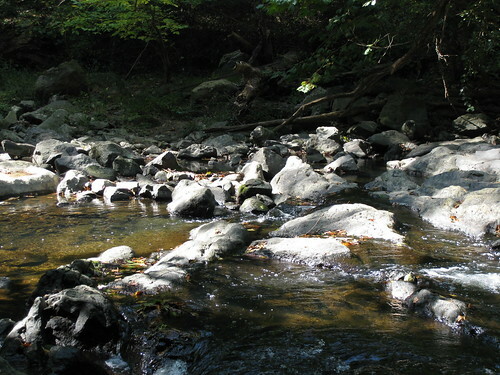 Sligo Creek? I’m not sure). It was too early for peak fall colors, but the weather was great and I enjoyed the views. It was amazing to walk along this little pocket of peace inside the Beltway. I saw a small woodpecker (a downy woodpecker, perhaps? 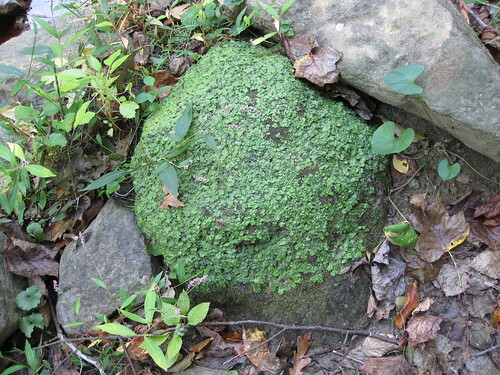 ), heard a bird call I still haven’t placed, and marveled at the mosses and fungi along the path. I was also amazed at how clean it was near this creek. We were in a major metro area and I really expected there to be the usual trash: candy and chip wrappers, newspapers, soda cans, etc. But it was very clean, with only a few debris found around the Beltway overpass. This was just a short trip, though, so in the late afternoon on Sunday I retraced my route. I boarded the Metro in Maryland, went through the District and into Virginia, where I caught a flight back to Illinois. It was a fun weekend, but short. A nice little getaway, and one that I’d love to repeat. I’m off for a quick weekend trip in just a few minutes. Since it’s raining and it’s afternoon, I expect there will be some sort of delay at O’Hare, but I hope it’s not too bad. I’ve haven’t really made time to write lately, but there are some good things to note. I’m getting eggs again! Hooray! Not as many as I used to, but the hens are getting older and the days are getting shorter, so I’m sure they’re doing their best. No new raccoon scares. Of course, I’m also being really good about locking them in the Eglu run at night, which is helping, I’m sure. No new cash drains have popped up. The car is working, and I’ll get the airbag issue fixed in just a week or two. I’m taking an afternoon off and looking forward to a relaxing weekend with plenty of travel knitting and reading time and lots of talking and visiting with a friend. Well, time to “cut the cord” and sign off now. I’ll likely send a few tweets, but I’m not bringing the laptop so there will be no blogging. Yesterday I couldn’t help this song running through my head: “Beautiful, beautiful Copenhagen/Friendly old, friendly old girl…” Copenhagen is a fabulous city. I visited there in the early ’90s and would go back again lickity-split if given the chance. Today, I started my day with a classic The The song running through my head “This is the day/your life will surely change…” Like many in Chicago, I thought we had a really good chance of winning the bid for the 2016 Olympics. What a huge disappointment that we were eliminated in the first round. I know many people — including several of my friends — were opposed to hosting the Olympics here. And I was actually ambivalent about it for the most part. As a Chicago native, I get excited that anyone likes my city even a bit. We suffer an inferiority complex here in Chicago: we’re a fly-over city for the most part and are most well-known for brutal winters (not always true) and classic gangsters. So the idea of hosting such a prestigious international event makes me swell with pride, and judging from the reactions of my colleagues today, I’m not the only one. Frankly, my first thought after I heard the judgment was: f*** the IOC. [Right, no song was running through my head then.] But, we’re pretty hardy folk, we Chicagoans. I heard one person say, “Chicago 2020!” We’ll see. In my own personal domain, things are looking up. I’ve gotten eggs for 3 days in a row now, and got 2 eggs in one day on Wednesday. I think I can safely carry out my plans to bake this weekend. Hooray! The dogs are doing well, the roommate experience is going well, and I am content. I had a couple opportunities to go out tonight, but I was just too exhausted at the thought. On the one hand, I think it’s good to have choices like that; on the other, I wonder if I’m actually a bit depressed. After all, I don’t have to sit at home on a weekend evening, but here I am. I reassure myself that if I’m tired I should stay home, and with Ken Burns’ excellent National Parks series wrapping up tonight, I’m justified in gluing myself to the TV screen to take it all in. Then there’s the other part of my brain that doubts my motivations. I keep saying I need to take a break from dating, but then I think: what am I hiding from? When I saw my therapist this week I talked to her about this conundrum and my belief that I’ve made consistently terrible choices in men over the years. As I listened to her point out that most of my examples were from when I was young and inexperienced or didn’t really represent horrible choices — just normal trial and error decisions — I have to realize that some of what I’m facing here is plain old fear and laziness. Dating is scary because you have to be always on your game and in touch with your thoughts and feelings. That takes a lot of energy and attention to what is going on in your head. What song matches that? I’m thinking it must be something by Leonard Cohen.